Ritual tools can be either made yourself, purchased in occult shops or passed on to you as a gift. When you obtain a new tool,consecrate it with the full moon. (Bury it in the earth from the full moon to the following New Moon.) The new tool should be blessed with Earth ( salt) Air (incense) Fire (flame) and Water (or wine) and a spell (of your choice) should be cast over the new tool to grant that it may be used for goodness. Amulet: An amulet is generally a small item made of natural materials - wood, stone , shell or gems - charged for the magical purpose of protection. Amulets are often ornate and can be either carried in a pouch or worn as jewellery. Asperger: An asperger is a device, constructed of either brass or silver, used to sprinkle water for purification at the beginning of spells. Bell: A bell or gong is often used in early stages of witchcraft to summon the power of the elements : Earth, Fire, Water and Air. Bolline: A balline is a white-handled knife used by witches for cutting, carving or inscribing things (candles, talimans etc..) during the course of a ritual. Book Of Shadows: The book of shadows is a magical journal kept by witches whereby spells and invocations, dreams, herbal recipes, ritual notes and divination results can be recorded. Candles: Candles are used frequently in spells, with their particular colours, fragrances, shapes and inscriptions serving a symbolic purpose. Chalice:The chalice is a goblet or cup used to hold the wine shared around the circle of those partcipating in a ritual. Charcoal: In ritual, charcoal is often used for inscribing and ceremonial incense is often burned on a charcoal saucer. Chord: A chord is either a heavy string used for binding or releasing spells. The colour and thickness depends on the spell being cast. ClothFelt and velvet cloths are often used in magic to contain charms and herbs that have been charged with power. Essential oils:Essential oils have long been used for their power of healing and to help specific states of mind. In witchcraft, oils have many purposes and different oils are linked with different usages. 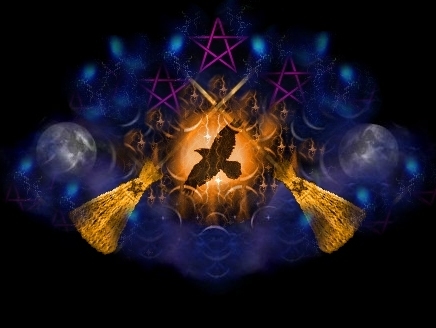 Feathers:Bird feathers are commonly used in magic ritual to represent freedom. Herbs: Herbs and flowers are used for their power of healing and attraction in witchcraft, and different herbs correspond with different requirements in witchcraft. Incenses:Incense comes in sticks, cones and powders, with aromas varying from floral to herbal mixtures. The incense burned depends on the purpose of each ritual, thought frankincense is considered to be have many properties and can be used for most spells. Pentacle: A pentacle is a disc of metal, wood or ceramic with a pentagram and various other symbols inscribed on it. Symbolising the element Earth, the pentacle is used in rituals of protection as a shield. Ritual ScrollThe ritual scroll in witchcraft is a set of instructions that help guide the spellcaster through the casting of a complex spell. Spellpaper:Using spellpaper and charcoal, the spellcaster is often required to draw a circle of eternity as part of a written spell which is burnt during ritual to herald union with the universe. Taliman: A taliman is a drawn symbol or a constructed item that is charged with specific energies. The taliman can either be worn as jewellery or carried on one's person, allowing its energy to exert a continual and subtle influence on the holder. Thurible: A thurible is a metal dish or burner used to hold charcoal and incense throughout witchcraft ceremonies. It is considered to represent the element Air. Wand: The wand in witchcraft is a stick about 18 inches long, carved from one of the traditionally considered "sacred" woods and used to channel power. The wand is often decorated and carved in accordance with the spellcaster's beliefs.